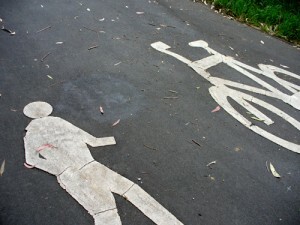 The signs, symbols and graffiti on the ground are all evidence of a territorial battle that is being waged among government authorities, property owners, motorists, cyclists and pedestrians. Now the stencils themselves are getting in on the act. It is clear that this walker has cracked up and has said something sharp to the bicycle. But a zealous graffiti obliterator has painted over his speech balloon and now we’ll never know what it was he said. 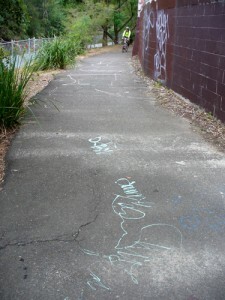 These particular stencils are on a pathway in Cadigal Reserve in Summer Hill. The pathway continues along beside Hawthorne Canal, which eventually runs into an arm of Parramatta River. The canal has a history of successive waves of pollution. Originally a stream called Long Cove Creek by early European settlers in Sydney, by the late 1800s it was fouled with house slops and the run-off from factories and slaughterhouses. The stink that it gave off was considered to be a health hazard and eventually it was excavated, re-aligned and lined with concrete in 1895 and renamed Hawthorne Canal. But over the years the stormwater it collects has still been polluted with leaking sewage and dirt, horse manure, oil, chemicals, plastics, heavy metals and garbage washed off the roads and nearby rubbish dumps. And then, some time in 1990s, the canal was subjected to what some people regard as visual pollution – graffiti. Taggers and graffiti artists continue to express themselves on the walls and under the bridges there. Their marks have spread to the pathway beside the canal. Government authorities and a bush regeneration group have done much to improve the banks of the canal in recent years, so it is understandable that they might want to remove ‘unsightly’ graffiti from the asphalt. They can’t win though. More pavement graffiti has appeared since the last applications of grey paint. 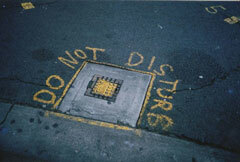 But I wish I had been there before they covered up that pedestrian’s outburst.